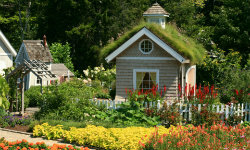 With its 248 acres, the Coastal Maine Botanical Gardens (CMBG) is the largest botanical gardens in New England. Its water-side setting (with nearly a mile of shore front), landscaped gardens, forest, meadows, and hillsides combine to make the gardens one of the top tourist destinations in Maine. While young by the standards of similar gardens (it officially opened in 2007), the gardens feature magnificent formal and informal gardens designed by several of the top landscape architects and horticulturists in America. The more formal gardens occupy the top of a hillside, and include fountains, statuary, streams, meandering pathways, open lawns, and a lovely central building with gift shop and indoor/outdoor cafe. Open year round, there is always something beautiful to see here; flowers bloom in profusion from the first spring bulbs to the last asters and chrysanthemums of the autumn. But the statuary, streams, and natural beauty of the site are always present. In winter, it is possible snowshoe the miles of trails in the gardens. From the Author: We have never sent a visitor here who did not come back impressed and delighted with these gardens. And for avid gardeners, it is simply not to be missed. No matter what time of year, there is much to see and appreciate. It's a great place for simply walking (and there are miles of trails through landscaped and natural areas), but those with mobility problems can make use of the complementary jitneys that can take visitors around the extensive grounds. While a botanical garden may not seem to be a particularly interesting place for kids, the extensive children's garden at CMBT will delight kids of all ages. There are statues throughout of favorite characters of children's books (such as the bear in Blueberries for Sal), a shallow stream for wading, plants with funny shapes and names, misty fountains that spray unexpectedly, buildings with grass roofs and slanty sides, and a entire area for construction of fairy houses.